Goldfish have existed domestically in artificial ponds, bowls and aquariums for generations. In captivity, they should not share habitat with other species of fish. Goldfish react poorly to other fish because of divergent care requirements and some behavioral issues. Goldfish react poorly to tropical water conditions. Most aquarium fish come from the tropics and need water between 72 and 82 degrees Fahrenheit. The goldfish prefers water colder than 70 degrees. Because of this, a goldfish will become stressed in a tropical tank. A stressed goldfish is more likely to develop health problems. 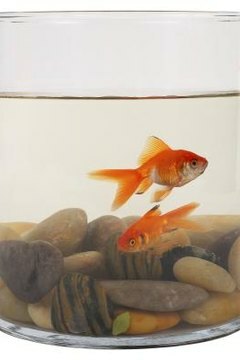 Goldfish and tropical fish have problems sharing a tank due to their different sizes. Healthy goldfish can grow to 12 inches. At such a size, goldfish have a predatory relationship with smaller fish. Despite their generally easy-going nature, a large goldfish will consider smaller fish to be food. Many varieties of goldfish have long, flowing fins, making them vulnerable to fin-nipping fish. Long-finned goldfish move slowly. Because of this, they cannot react well to smaller, fin-nipping fish. Since the goldfish cannot respond, they tend to get picked on, and the bites can lead to fin rot and other secondary infections for this reason, never keep a goldfish with nippy fish like barbs, certain tetras and freshwater pufferfish. The biggest problem for goldfish sharing a tank is disease. Tropical fish and goldfish have adapted to different suits of disease-causing organisms. Because of this, goldfish can carry diseases that devastate tropical fish and vice versa. Can Fiddler Crabs Live with Goldfish? Do Kissing Pink Fish Get Along With Goldfish?